The proofs! The published planner is just as beauteous, but without the PROOF strip across the front! I’ve been working on a secret project lately, and I’m excited to share it with you at last. But first I want to talk about the biggest problem we face as part-time writers. You already know it: time. Everybody has other things they must do – work, take care of family, walk the dog, fetch groceries. Plus, you know, sleeping and eating. Every week is a battle to carve out time for writing. So what’s the answer? I didn’t have control of my writing time until I started consciously planning it – the way I plan my time at my day job, with tasks and targets and ticking off what I’ve done. I would tear out a page of plain paper, write on the days of the week, and fill in tasks for each day – a wordcount goal, the name of the project I was working on, and any hard deadlines I had to meet. Seeing ‘Submit by Friday! !‘ in bold letters certainly focused my mind. I worked like this for over a year, during which I finished two 120,000 word first drafts, plus blogging regularly and submitting stories to various outlets. 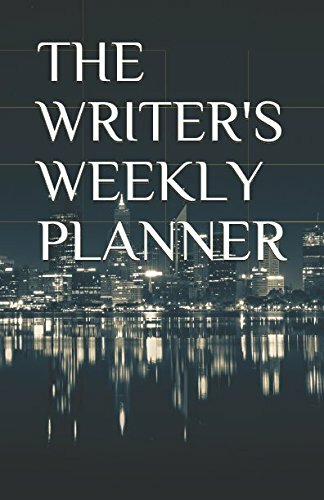 Without my writer’s weekly planner, I would never have been able to commit to that writing time. My planner also let me track my learning. Doing the DIY-MFA I wanted to read a poem every day, plus study writing craft, plus keep up with my mental ‘input’, namely, reading fiction. By adding these to my planning sheet I was much more likely to achieve them. I still had a problem though – I was tired of writing out my goals on a fresh sheet each week. And filing them seemed a chore. So I decided to upgrade myself to a proper planner. I looked everywhere for a readymade planner which suited the way I manage my time, but nothing seemed to match what I needed. I wanted a weekly writing planner to track weekly and daily goals, with space for recording my blog and social media contacts too. So I designed and created my own planner, and then thought: This would help other writers out there. Bloggers too! 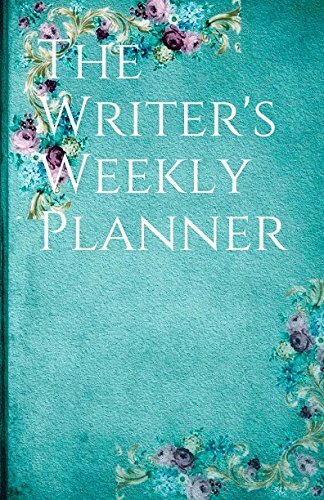 So here it is – The Writer’s Weekly Planner, available on Amazon now, with more than a year’s worth of weekly spreads for you to complete. It’s undated, so you can start whenever you like – no waiting for January 1st. 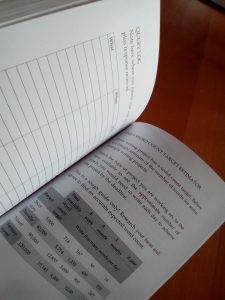 It includes a word count estimator in the back so you can work out how many words you’ll need to write each day, to complete your project in the target time. And it includes space for you to plan and record your social media shares, your critiques of others’ work, and your blogging. I’m so pleased with it – at last, I have a writing planner that works for me. Reinforcing a daily writing habit. Those word count boxes cry out to be filled in! For me, this is the number one benefit. Clear goal-setting. No more ‘maybe I’ll work on something this week’. read a poem, and an article, get some fiction reading under my belt, and work on writing craft. You could also use these boxes to track Activity, Coffee intake (or water, I suppose…) or anything else you liked. Reminder to fulfil my critique obligation in my writing community. Blogging every week, not just whenever – helping me keep up visitors to my blog, who come back to see my regular updates. Tracking an annual word count total. This reminds me that even when it feels like I’m not achieving much, I am writing, and writing and it is all experience. There’s a saying about putting in 10,000 hours to become an expert in your field. Well, seeing my annual word count reminds me that I’m edging closer and closer to that goal. Most of all it represents a commitment to writing. It’s great as a physical object too. I love being able to flick back through a year’s worth of writing and reflect on how much I’ve done. I made two cover designs, a beautiful faux-book-jacket blue one, and a striking monochrome cityscape one. They’re 8″x5″ so not too large, but not tiddly like a lot of regular diaries. The paper is white for easy writing. Both are paperback planners, so they can just slip in your bag or live on a quiet corner of your desk. I’m really excited about this project, and have already started using my proof copy of the black one to keep myself on track with these twice-weekly blog posts and my writing commitments at Short Fiction Break, not to mention my ongoing revisions of my book. 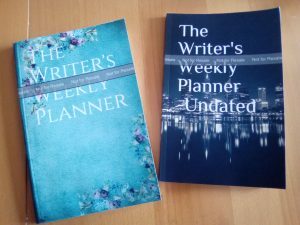 I am pleased with the planners but I want to do even more to help writers, so I’m asking you now – what would you like to see in a future Writer’s Weekly Planner? Excellent! What a beautiful and well designed planner. I must have one, and maybe a second as a gift. I’m so excited about this! 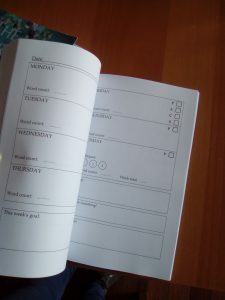 As someone who is jumping into the freelance writing world, I’ve been on the hunt for this sort of planner. Thanks for taking the time to make a useful tool for writers! Thanks Bea! Please review the planner too – would love to know what you think when you get it!